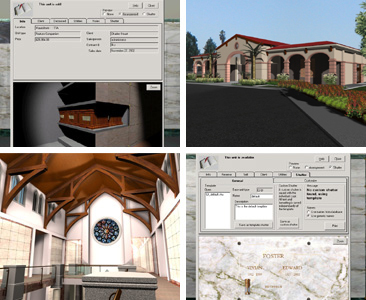 ViewFINDER is a multimedia facilities management application for cemeteries and mausolea. This revolutionary technology features a graphically rich user interface combined with sophisticated data entry and management tools, benefiting project managers and sales teams. With ViewFINDER, users and clients alike can experience unparalleled graphic representations of a building or garden, often before construction is completed. ©2018 Milne Australia - Providing mausoleum construction, cemetery master planning, architecture and engineering, and memorial structure design and cost study services.